Locke & Key tells of Keyhouse, an unlikely New England mansion, with fantastic doors that transform all who dare to walk through them.... and home to a hate-filled and relentless creature that will not rest until it forces open the most terrible door of them all... Acclaimed suspense novelist and New York Times best-selling author Joe Hill (Heart-Shaped Box) creates an all-new story of dark fantasy and wonder, with astounding artwork from Gabriel Rodriguez. Papa Locke is killed by Sam Lesser, a high school student who is egged on by Dodge, a pretty lady in a well at the Keyhouse, who wants the Anywhere Key. After the horrific event, the Locke family move to the Keyhouse, where Bode, the youngest child, discovers that some really weird stuff is going on. Like, he’s able to turn into a ghost if he goes through this specific door. He meets Dodge, and starts telling her about all the stuff going on in his life. Dodge helps Sam Lesser escape prison, and Sam makes his way to the Keyhouse. Dodge tells Bode to find the Anywhere Key, and promises he’ll help get rid of Sam before he kills any of Bode’s family. Dodge escapes the wellhouse, and Kinsey shoots Sam Lesser. Dodge breaks Sam’s neck and shoves him through the ghost door. Dodge changes into a guy, and turns up at Ellie Whedon’s house. Dodge went to school with Ellie and Mr Locke. The Locke family is in Mendocino Valley. The children are outside by the river, and Tyler is complaining about being bored. Back at the house, Sam Lesser and a bloke called Al Grubb, two people that the Lockes know from San Francisco turn up with guns and a knife. Tyler looks through the window, and sees that they have killed his father. Tyler attacks Sam Lesser in the basement, and Nina Locke, his mother, takes out Grubb with an axe. 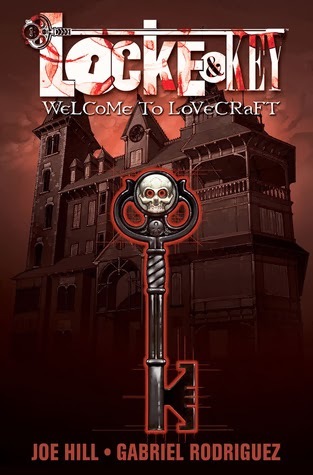 The family are distraught, and move to Keyhouse, the Locke family home in Lovecraft, Massachusetts, to live with Duncan. Bode goes exploring and finds a key. Sam Lesser is now in prison. He speaks to a face in the toilet. Yeah, it’s as weird as it sounds. The face promises that soon all the doors will open. It’s very vague and rather ominous. Bode steps out of the door that he unlocks with his new key, and becomes a ghost. His body drops dead. He figures out that he is able to go back into his body at will. He draws a picture of what happens to him, which Nina and Duncan see but they think he’s just fantasizing. Bode goes exploring as a ghost. He later tries to tell his sister, Kinsey, what happened, but she gets angry and doesn’t believe him. Bode hears noises coming from the wellhouse. The voice tells Bode that it is his echo. Bode tries to show Tyler and Kinsey, but when they go back to the wellhouse, there is no noise. Bode goes back to the wellhouse as a ghost. He goes into the well, where he sees a pretty demonic looking lady, who was also the face in Sam Lesser’s toilet. Bode goes back yet again, in his body this time, and starts using the pretty lady as an outlet, since no one else will listen to him. Pretty lady asks Bode for a mirror and some scissors. She also tells Bode about an Anywhere Key, which takes you anywhere you would like to go. Pretty lady passes the mirror and scissors to Sam Lesser through his toilet. Bode tries to show Kinsey the ghost door, and he demonstrates this time. Once again, she doesn’t believe him; she thinks he’s just being weird. The police show up at Keyhouse and tell the family that Sam Lesser is out of prison. Nina starts to fall apart. Kinsey’s teacher, Coach Whedon, comforts Kinsey, and shows her a photo from her old yearbook, which features Kinsey’s father. And also a guy called Lucas Caravaggio, who looks suspiciously like the pretty lady in the well. Kinsey goes back to her old self, mostly. She fixes her hair and puts her piercings back in. Bode continues to have semi-psychic dreams about his father and trucks and Sam Lesser’s tattoo. Sam Lesser is hitchhiking with truckers, and performing sexual favours. We get a glimpse into his past. He was abused by his dad, and bullied in school. He went to Mr Locke, who was his teacher, who wanted to give him some financial aid forms. In Mr Locke’s office, Sam saw a picture of the wellhouse, and the pretty lady was in the photo, asking Sam for help. Sam left the office, and came across an angry Tyler, who is very upset and tells Sam to do him a favour and kill his father. Obviously he didn’t mean it, and was speaking out of anger. The pretty lady’s name is Dodge, by the way. It’s revealed that Sam Lesser went after Mr Locke because he was trying to find the Anywhere Key for Dodge. Sam catches a bus to Lovecraft, and kills everyone on it. He then threatens a fisherman to ferry him to the Keyhouse. Bode goes to see Dodge in the well, and starts questioning the fact that she is meant to be his echo. Bode tells Dodge that he won’t be coming to the wellhouse any more, and Dodge starts climbing out of the well like the girl in The Ring. Dodge asks Bode to look for the Anywhere Key. Dodge reveals that she used to know Bode’s father, and that they were good friends. Sam Lesser arrives at the Keyhouse. He attacks Kinsey in the garden. He locks Nina and Duncan in the wine cellar, and Tyler, hearing a commotion, goes to investigate. Sam pushes Tyler down the stairs and whacks him with a piece of wood. Dodge tells Bode to get the Anywhere Key and let her out, so she can save his family from Sam. Sam starts threatening Nina and Duncan with Tyler’s life. He tells them that he wants the key, or Tyler will die. Bode finds the key in Kinsey’s bracelet. Sam attacks Tyler when Tyler pretends to know what key he is on about, and Tyler gets pushed through the ghost door. Finally, he sees that his brother wasn’t making that stuff up. Bode gives the Anywhere Key to Dodge, and Dodge is able to escape the wellhouse. Dodge uses a second key to go through a cupboard and change into a rather good looking guy. Sam, believing Tyler is dead because his body is rigid, starts to relax. Tyler goes back into his body and takes Sam by surprise. Kinsey wakes up and shoots Sam in the neck. Sam runs, and comes across Dodge in the hallway. Dodge breaks Sam’s neck and shoves him outside, claiming to do it because he needs Sam. Dodge escapes using the Anywhere Key, just as the cops arrive. Dodge turns up at Coach Ellie Whedon’s house, and demands to be let in since he killed Ellie’s mother for her. The cops and the adults have no clue what’s been going on. You see Sam’s ghost turn up at the ghost door. Two weeks later, Kinsey and Bode are talking about the crazy stuff that happened. Dodge turns up and starts to flirt with Kinsey, and Bode is clearly suspicious of him. Bode finds a new key in the pond. Anywhere Key – Can take you anywhere you like by unlocking any door. Ghost key – Turns you into a ghost if you go through a specific door. Gender key – Changes your gender.